Two books from the Chess Secrets series brought together in one volume. Chess Secrets is a series of books which uncover the mysteries of the most important aspects of chess: strategy, attack, classical play, opening play, endgames and preparation. In each book the author chooses and deeply studies a number of great players from chess history who have excelled in a particular field of the game and undeniably influenced those who have followed. 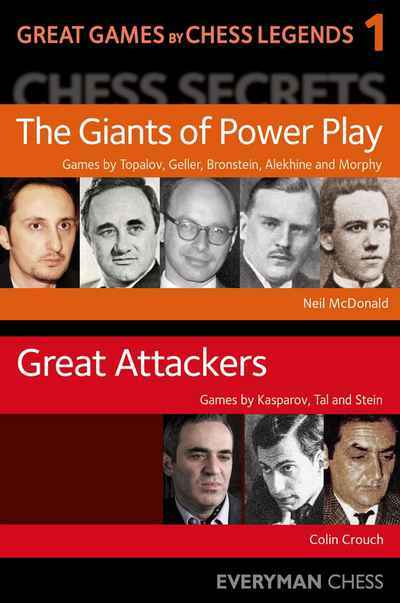 Chess Secrets: The Giants of Power Play: Learn from Topalov, Geller, Bronstein, Alekhine and Morphy by Neil McDonald. In The Giants of Power Play, Neil McDonald selects five players who have excelled in the field of 'power play' - the art of putting opponents under constant pressure. McDonald examines the contributions made by each player, their differences in approach and style, and from Morphy to Topalov, how they followed in each other's footsteps. Chess Secrets: Great Attackers: Learn from Kasparov, Tal and Stein by Colin Crouch. The chess world has witnessed a great number of wonderfully gifted attacking players, geniuses who have dazzled the chess public with their brilliant masterpieces. Everyone has their own favourites, and in Chess Secrets: Great Attackers, Colin Crouch chooses three of his own: Garry Kasparov, Mikhail Tal and Leonid Stein. World Champions Kasparov and Tal need no introduction, while Stein was a highly creative and intuitive player with the ability to destroy the world's best players with his vicious attacks.